FEICIM started in 2009 as a project which aimed to put some fun into the learning of Irish. With a range of Irish courses already available, FEICIM founder Bríd Ní Chualáin aimed to develop a course that would also give participants a true experience of island life. As Inis Oírr is one of the strongest Gaeltacht areas (over two thirds of islanders speak Irish on a daily basis) FEICIM makes full use of this privilege to provide courses where the participants on our courses get to meet many native Irish speakers - young and old. Much emphasis is placed on the social and informal use of the language and it is this playful approach that sets FEICIM apart from other organisations – it’s a holiday as much as a course! Bríd Ní Chualáin, founder and manager of FEICIM is a native Irish speaker from Inis Oírr, where she reared her three children. Bríd spent many years teaching Irish to people who moved to the island and holds a NUIG Masters degree in ‘Léann Teanga’ (extensive Irish language studies) as well as a NUIM Diploma in Teaching Irish to adults (1st Class Honours). Bríd is currently working in the area of Language Planning with Údarás na Gaeltachta – the Gaeltacht development authority. She enjoys swimming, playing cards and playing a few tunes in the local bars at night and discussing minority language revitalisation and other such light subjects. Ben Ó Ceallaigh is a PhD student in the University of Edinburgh’s Celtic Department. Originally from west Roscommon, Ben hated Irish at school but started learning it in earnest after seeing a Punk band singing in Scottish Gaelic in 2007. After completing the masters degree in Language Planning with Acadamh na hOllscolaíochta Gaeilge and spending several years living as a lodger in the Galway Gaeltacht, he got a doctoral scholarship from the University of Edinburgh. Ben is in his fourth year of a sociolinguistic study of the effects of economic forces on the Irish Gaeltacht. 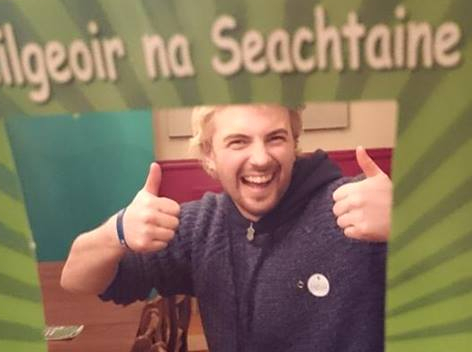 As part of his scholarship, Ben teaches Irish to students doing a degree in Scottish Gaelic, and also to students of linguistics or Irish history. His interests include minority language revitalisation, Punk music and camping. All FEICIM teachers have third level qualifications in Irish, along with experience teaching Irish at every level in a wide range of situations. When not teaching on Inis Oírr, all our teaching staff work full time promoting the Irish language in various ways – community-based projects, research, teaching and more. We draw on this valuable experience when teaching with FEICIM, allowing us to provide a context and depth for our courses that is not widely available. Last year, for instance, we ran a workshop that explained the status of Irish as a minority language in an international context. This session was very successful and allowed both students and staff to share their thoughts on revitalising the language during an interactive and stimulating discussion. This project received grant aid from Comhar na nOileán Teo’s Rural Development Programme which is financed by the Irish Government under the Rural Development Programme Ireland 2007-2013 and by the European Agricultural Fund for Rural Development: Europe investing in Rural Areas.